We’re rounding out Week 2 of the One Room Challenge and things are cruising right along. I finalized the concept board this week and am loving the punches of color this space will have - which if you know me - is a first in our home. Everything so far has been very neutral with small pops of pattern and color (mostly blue because not going to lie, I’m freakishly drawn to the color blue…) but this room will get a heaping dose of pink, yellow and green and I’m not one bit mad about it. Pretty sure the girls won’t be either, but the husband is still TBD…guess that’s the rub of living in a house with three girls, ha! A desigated area to store books, toys, blocks, games and every other random object they’ve collected across three short years on earth (which includes way more toys used as bribes by our pediatrician to stop the screaming than I’m ok with). 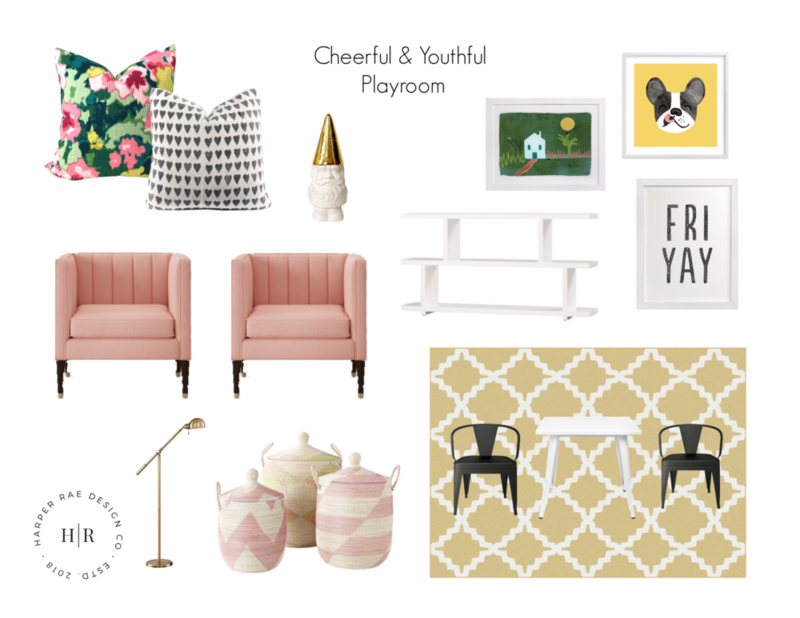 An activity table area to play with said items in a calm and organized manner (a girl can dream, right??). A gallery wall to hang all our favorite pieces of art, including a rotation of the girls’ latest artistic endeavors. A reading/hanging/chill-out-and-watch-the-madness-unfold area for mom and dad (and guests) because our current approach of hanging out on the floor isn’t working for our tired backs. I don’t need to be reminded about my age everytime I peel myself up off the floor…. Also, since one of my goals of the space is to ease my transition from design school/girls in part-time daycare to working from home/the girls home full-time is to start a playgroup to nurture them socially (but mostly to beg my mom friends to visit me and keep me sane), I need a spot for guests to sit and make their own very best attempt to relax. I want to talk a bit more about the role-play area because it incorporates one of the functions of planning a space that I love most, and that is thoughtfully designed elements that account for the future. This will be a spot that leaves room for updates as the girls continue to grow and change. Right now they’re really into “playing house” so that’s the direction we’re heading, but at some point soon I can tell they’ll be into playing dress-up and after that I’m sure it’ll be something else, so I can update the nook when they’re ready for each new stage. I especially love designating a spot like this in a kids space because their interests change frequently. Plus it leaves opportunity to modify a room when you hit that boredom stage or need to bring a creative burst to your home life without a major hit to your wallet. It’s a total win! For their playhouse area right now, I’m designing around a few of their favorite things that we already have on hand like the little teepee below I scored off Amazon for Z’s second birthday. I also ordered the black pom pom garland from there too and then proceeded to painstakingly hot glue it on to give it some life and the results were well worth all the finger burns!! I think it’s obvious from the pic that she is impressed by mom’s DIY skills, hehe…. In the playhouse area, I’m pulling in this kitchen set they got from grandma for Christmas last year and this mini cleaning set which is not only adorable, but works surprinsingly well. It’s probably the one toy in our house that manages to tackle the mess rather than contribute to it. Melissa & Doug have got this kids toy thing figured out and I’m forever thankful for almost everything they create! Send B’s dress away for framing (see this IG post for more details!!!). Pick out and order two poufs for reading nook. That’s it! I’m going to repost this list with each of my weekly updates and cross out the things that are completed, so you can share in the progress. It sounds like a lot to do in six short weeks and it is, but I’m feeling confident about almost everything. The market build out might be the only thing I’m worried about completing because DIY tasks just don’t get done around this house like they did pre-kids. I think we can do it though! Love this playroom design concept enough that you want to keep it close to your heart forever and ever like I do? Well, here’s a pinnable image to help you do that!